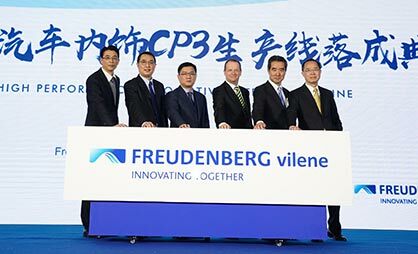 Freudenberg & Vilene Nonwovens brought a new production line for car headliners into operation at its Suzhou site in Eastern China. This enables the company to meet the increasing demand for high-quality car headliners in China and South-East Asia. Freudenberg Performance Materials is the specialist for technical textiles of the Freudenberg Group. In China, Freudenberg & Vilene Nonwovens, a joint venture with Japan Vilene Company, Tokyo / Japan, represents the Group. With the new production line, Freudenberg will increase its annual production of technical textiles in Suzhou by around 8 million m2. Customers will particularly benefit from higher quality of the next generation headliner products. “This investment underscores our long-term commitment to Asia. We want to continue to support our customers in the automotive market with innovative and sustainable solutions that will help them grow”, commented Dr. Frank Heislitz, CEO of Freudenberg Performance Materials. Freudenberg & Vilene Company headliners are based on nonwovens and can be finished in various ways to provide additional functionality. Apart from excellent surface appearance with good abrasion resistance, outstanding acoustic properties and improved stain resistance, these products contribute to higher comfort in the car interior as well as marked reduction in vehicle weight when combined with other vehicle components. In addition, the company also uses a proportion of recycled products in the manufacture of its products. In this way, Freudenberg helps its customers to reduce their environmental footprint. “Freudenberg & Vilene Company offers its customers innovative products ensuring consistently high quality”, explained Heislitz. Freudenberg & Vilene Company first introduced printed headliners to the market in 2010, thus capturing a special customer need. Already in 2016, the company investment in an additional production line. Freudenberg Performance Materials is an established and reliable partner to the automotive industry worldwide. In Asia and China, Freudenberg & Vilene Company enjoys long-standing relationships with Asian OEMs, where it holds a leading position in the market. A cornerstone of this success has been the ability to create numerous headliner innovations. Alongside the production of products for car interiors, Freudenberg & Vilene Company’s product portfolio includes industrial nonwovens for the apparel industry, industrial ventilation and other technical applications.